.Since we don't have a Filipino Store or restaurant here and if we want to eat Filipino dish we have to travel at least 2 hours to the store and buy some ready made. I told myself why not make my own instead of travelling so far? Aside from that we can save money by making the same food that we will just buy the ingredients in our store here. A fellow kababayan gave me this amazing recipe through facebook. She said she found this recipe tried it and it works pretty good. She's been making this Garlic Chicken. So I said why not? Why can't I make it then. And I am glad I tried. I ain't no cook at all but if there is a recipe surely I'll make them. What did my hubby says? He loves it, except that he don't like chicken with bones. Oh, that is one thing that I have to deal with. 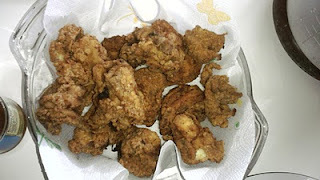 But since I am the one who's cooking he can't stop me but enjoy the garlic chicken and the bony chicken. I can't wait to make another, until I'll master this dish. After making this meal I went directly online and play kids games. I love it although the games is really for your kids.